The proprietor of Le Mieux Bistro is a local celebrity chef Ricky Cheung, who takes part in many local television shows and writes columns in magazines, including the Chinese food magazine 飲食男女. Ricky used to be the executive chef of Scala Restaurant in Renaissance Hong Kong Harbour View Hotel, and first opened the restaurant in a former factory building in Chai Wan, and later moved his restaurant to Wan Chai in 2010. 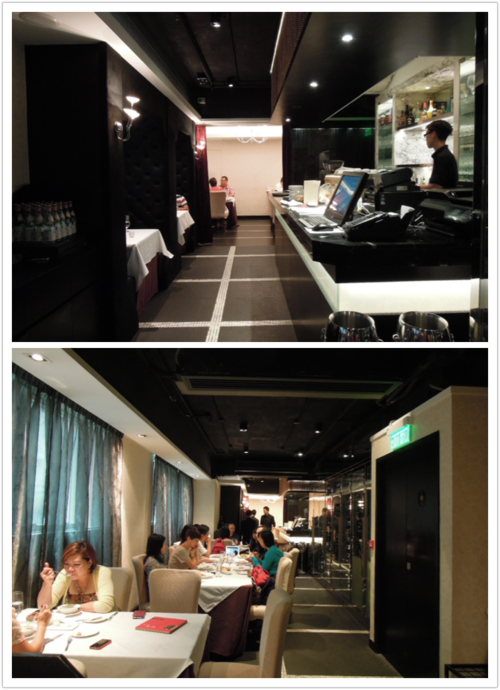 The restaurant’s interior is small and simplistic, and hosts around 50 diners. When we were having lunch there on a Saturday afternoon, Ricky Cheng briefly showed up at the restaurant. Some diners seized the opportunity to take photos with him, and then he quickly disappeared, apparently off to shoot a TV show. His appearance struck me as a bit insincere, and the situation was slightly awkward! Set lunches range from $165 to $290 for 4 courses, and set dinners cost $550 or $690 for 4 or 5 courses. While the food at Le Mieux Bistro tasted very pleasant, it was definitely not authentic French cuisine, and dishes were modified to suit local tastes. The service was polite and helpful, but the waiters could not answer our questions on some of the courses or ingredients, and had to check with the manager. (1) S and I were quite impressed with the appetiser, penne with mushroom & bacon. 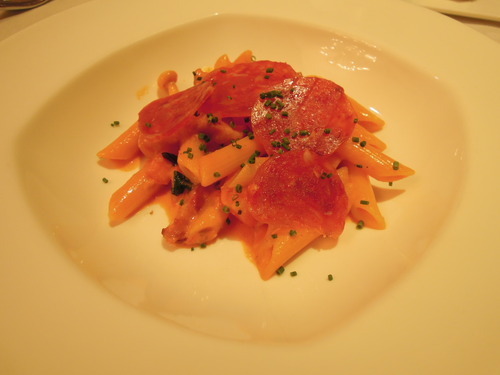 We liked the creamy tomato sauce, which was a touch spicy and tasted just right, the chorizo was a marvelous addition and the penne was fantastically al dente. (2) The seared French duck foie gras was similarly accomplished. 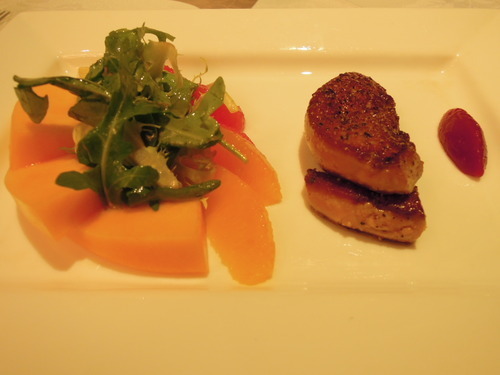 The foie gras was delicately seared and beautifully tender on the inside, and was served with a sweet, fruity sauce. The accompanying salad was fresh and vibrant, and the fruits were sweet and juicy. (3) The set menu also comes with a soup. The cauliflower velouté (above) was creamy and nicely seasoned with herbs, and the mushroom and cauliflower chunks added a gorgeous texture to the soup. 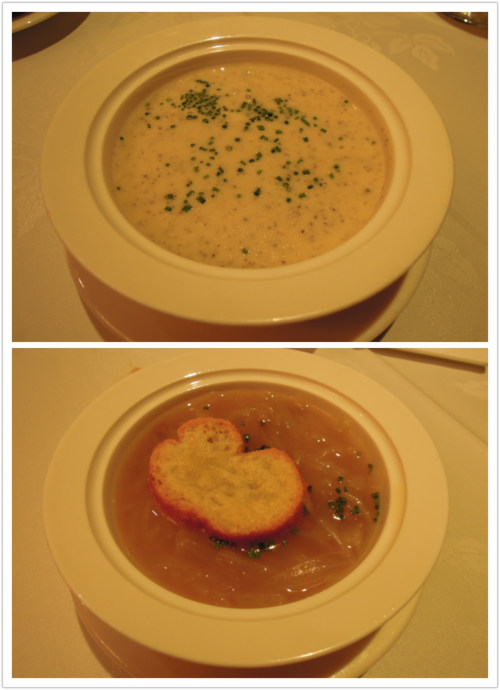 The French onion soup (below) was full of flavours, and the onions were soft and delectable. The lightness of this onion soup was fantastic! 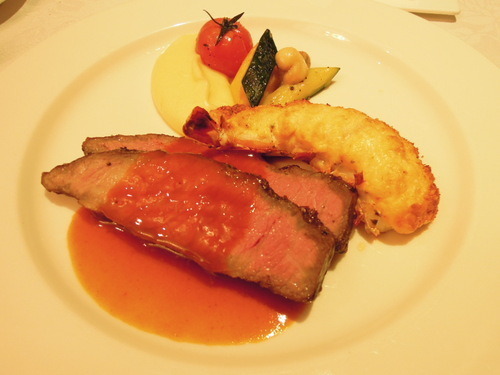 (4) The slow-cooked u.s. short rib of beef and king prawn gratinated with seafood mousseline was yet another dish that impressed us. The king prawn, seasoned with salt and pepper, was extremely flavorful. It was topped with some light seafood foam made with shrimps, fish and scallops, which I found a bit watery, but the prawn itself was gorgeous. The short ribs were tender and delectable, the mashed potato was smooth and buttery, and the vegetables on the side were skillfully grilled. 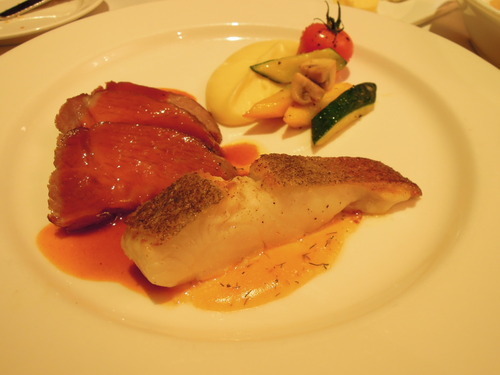 (5) The next dish we tried was the roasted kurobuta pork loin and pan-fried turbot fillet. I really liked the turbo, as it was exquisitely tender and juicy, and was magnificently crispy skinned. As for the kurobata pork loin, normally I would find pork belly more exciting than pork loin, but this one had a superbly soft yet chewy texture, and the sauce was spectacular. Having said that, the combination of fish and pork was too much – I would happily have eaten just one of the two as my main course, and putting the two types of meats together made them distract from each other. 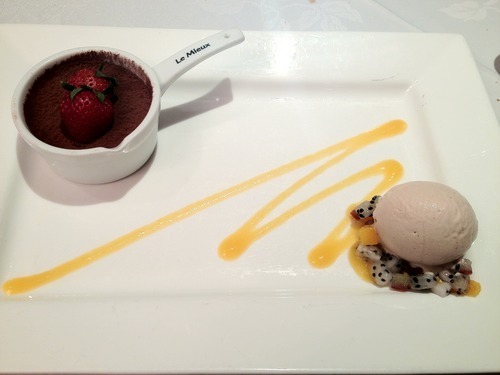 (6) The assiette of dessert on the set menu was a Tiramisu with strawberry ice cream. While the Tiramisu was thick and creamy, there was not enough coffee or kahlua taste to balance out the richness of the mascarpone! Conclusion: Bearing in mind that chef-owner Ricky Cheung used to be the executive chef at Scala, I was disappointed by Le Mieux Bistro’s lack of finesse, in terms of the setting, service and seletion on the menu. I would definitely say that the food at the Le Mieux Bistro tasted delicious and that the ingredients used were top-notch, but for me, authenticity is the key, and Hong Kong-style French dishes is just not my thing. May I have the restaurant address of Chef Corner’s Mr. Ricky Cheung. Thanks for your message! Sorry I am not affiliated with Mr Ricky Cheung or the restaurant, please contact the restaurant directly.